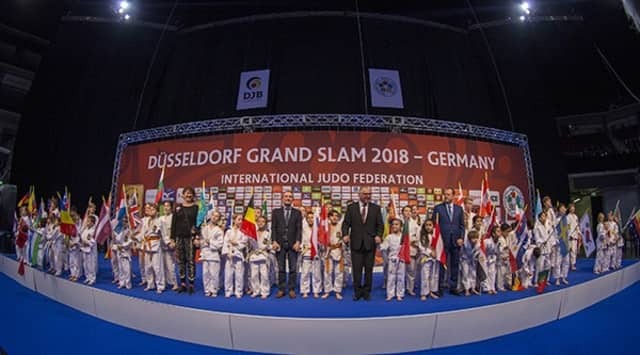 The second day of the first Düsseldorf Grand Slam saw three countries capture gold as Olympic champions experienced mixed fortunes at the atmospheric ISS Dome on Saturday. Japan, who were sitting pretty with three gold medals after the opening day, added a further two titles with gold in the men’s -73kg category and the women’s -70kg category. Slovenia ruled the -63kg category but not through the judoka one would naturally assume while Iran won the -81kg title. Olympic and double world champion ONO Shohei (JPN) won for the first time since Rio 2016 with an electrifying display as his namesake ONO, this being ONO Yoko, took the -70kg title as both champions clinched their second Grand Slam titles. Slovenian’s Olympic champion Tina TRSTENJAK was stunned in the preliminaries but the European nation had a second tilt at gold which Andreja LESKI (SLO) duly delivered by overcoming Japanese opposition. Iran have an ever-expanding presence on the IJF World Judo Tour and their go-to man Saeid MOLLAEI (IRI) won his first international title. Before the medal contests whipped the crowd into a frenzy on Saturday evening, the opening ceremony set the tone for the competition as fans observed the respective anthems of Germany and of the International Judo Federation before being warmly greeted to the competition and informed about the desire for the country to make a success of their first Grand Slam. As a large group of children in judogi gathered on the stage and held the flags of the 65 competing nations, they formed an original backdrop for the distinguished guests who addressed the crowd. Ms. Andrea MILZ, Secretary of State for Sports and Volunteering in North Rhine Westphalia, said: “Dear fans, organisers, I am happy to welcome you in Düsseldorf. 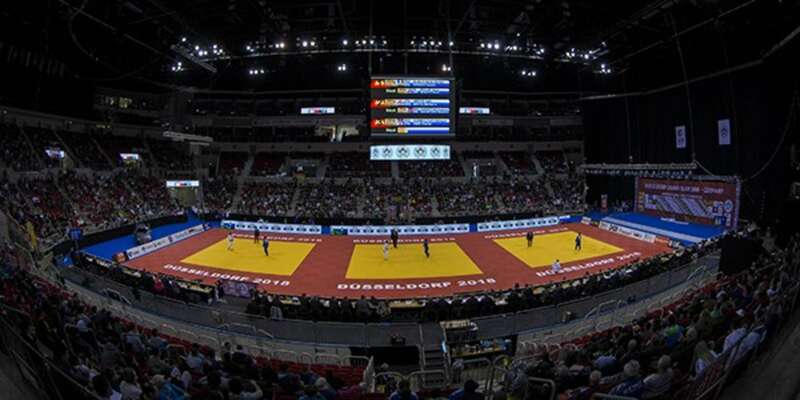 We are all proud to have this event here in Germany and Düsseldorf is already established as a good host of judo having staged a Grand Prix for many years. 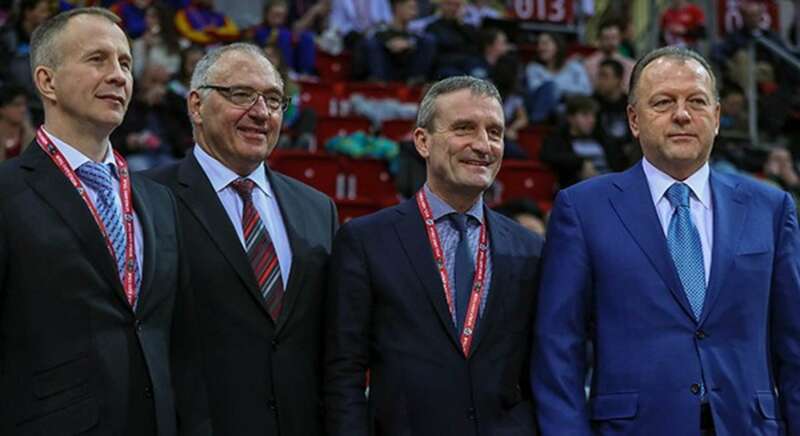 Mr. Peter FRESE, German Judo Federation President, said: “Dear Ms. MILZ, Dear Mr. VIZER, dear Mr. GEISEL, thank you to North Rhine Westphalia, thank you to Düsseldorf for the great support. I would like to say a special thank you to the IJF President Mr. Marius VIZER who supported us to host a Grand Slam. I also thank the EJU President Mr. Sergey SOLOVEYCHIK for helping us. Judo is a sport where you always stand up and continue to fight, you overcome your struggles and keep moving forward and this is an attitude for life." Mr. Peter FRESE, German Judo Federation President and Judo for Peace Commission member, explained how the programme came to be represented in Germany. “I am very passionate about judo’s ability and power to impact societies and it’s important to me to show this at our first Grand Slam in Germany. In judo we all know the values which make our sport special but not everyone knows these and we must work hard to change that. 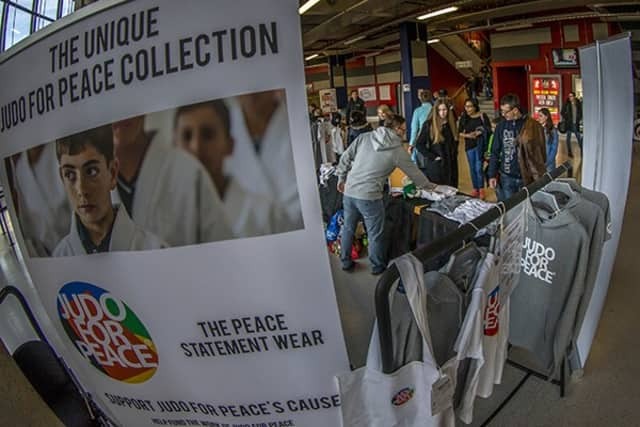 Judo is about friendship and respect, which judo shows more than any other sport, and lots of fans have learned more about the IJF’s work in the Judo for Peace programme this weekend. World number 16 Andreja LESKI (SLO) succeeded where teammate and Olympic champion Tina TRSTENJAK (SLO) failed as the former was the hero for her country. LESKI earned her first Grand Slam victory by besting Tokyo Grand Slam bronze medallist TSUGANE Megumi (JPN) in the -63kg final. Former rivals represented the judoka with ex-European champion Rok DRAKSIC now in the Slovenian coaching chair while former world champion AKIMOTO Hiroyuki was influencing the Japanese. TSUGANE, who burst on the scene when she won the Tokyo Grand Slam in 2012 as a teenager, was caught for a waza-ari score as the young Slovenian outperformed the young Japanese in addition to her world-renowned colleague. In the first semi-final Beijing 2008 Olympic bronze medallist Ketleyn QUADROS (BRA) fell to LESKI by a waza-ari score as the veteran moved down into a bronze medal contest. In the second semi-final TSUGANE defeated Asian Championships bronze medallist BOLD Gankhaich (MGL) by ippon with two minutes left on the clock after countering a uchi-mata attempt. The first bronze medal contest was won by BOLD who beat world number 191 Maylin DEL TORO CARVAJAL (CUB). 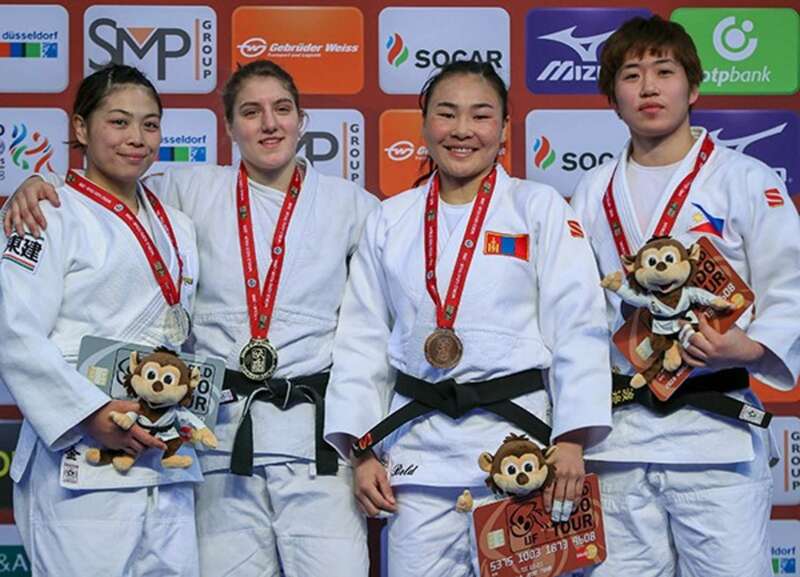 DEL TORO CARVAJAL had shocked TRSTENJAK by throwing twice with uchi-mata to win by wazari-awasette-ippon but had to settle for fifth-place at her first Grand Slam. As both judoka were fighting for a Grand Slam medal for the first time the opening four minutes were closely contested. The fighting spirit of the Cuban and Mongolian foes was appreciated by the crowd who applauded both judoka at the end of the four minutes with more to come in golden score. As DEL TORO CARVAJAL tried to drop under BOLD the Mongolian countered to take her opponent back and over for a waza-ari score to win the first medal contest on day two. The second bronze medal was won by former Paris Grand Slam bronze medallist Kiyomi WATANABE (PHI) who threw QUADROS for a waza-ari with a sumi-gaeshi and put pressure on the Brazilian on the ground as the Beijing 2008 Olympic bronze medallist tapped out after picking up a knee injury. WATANABE remains her country’s only Grand Slam medallist and a source of inspiration for the Philippines’ budding judoka. Tokyo Grand Slam winner ONO Yoko (JPN) won her second Grand Slam title with a resounding triumph over World Judo Masters silver medallist Barbara MATIC (CRO). The -70kg category has been a rich means of honours in recent years with Olympic champion TACHIMOTO Haruka (who has since retired) and world champion ARAI Chizuru leading the way in 2016 and 2017. ONO has high ambitions to emulate those achievements and is making serious strides after winning her fourth competition in a row. On this occasion ONO pinned down MATIC for 20 seconds and ippon. In the first semi-final Tunis Grand Prix bronze medallist NIIZOE Saki lost against MATIC who countered an off balance ura-nage attempt for ippon. In the second semi-final ONO bested The Hague Grand Prix silver medallist Sanne VAN DIJKE (NED) by a waza-ari score to seal a place in the final. The first bronze medal was awarded to VAN DIJKE as the hosts were again denied their first medal at home. 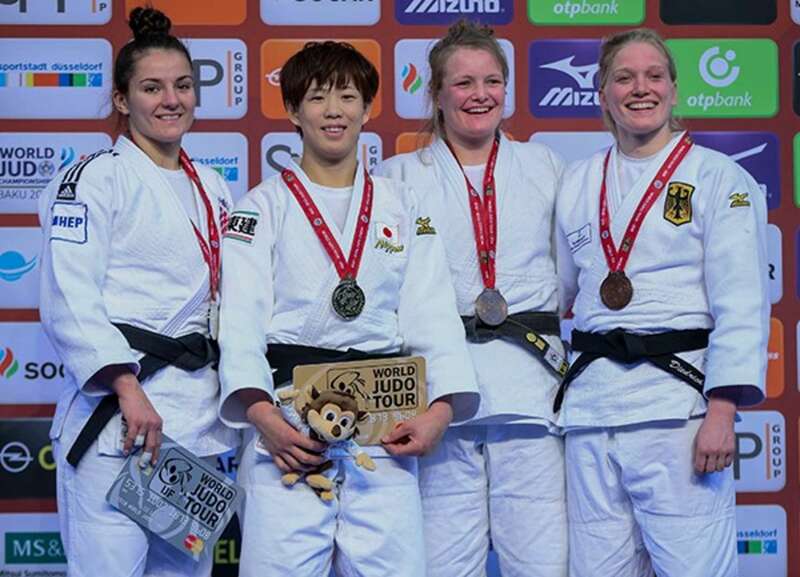 Dutch ace VAN DIJKE defeated 17-year-old Junior world champion Marlene GALANDI (GER) by ippon with a tani-otoshi to stun the crowd as Germany’s Grand Slam newcomer finished a respectable fifth. The second bronze medal was won by former Tbilisi Grand Prix winner Szaundra DIEDRICH (GER) who registered Germany in the medal column with a win over NIIZOE. DIEDRICH attacked with ouchi-gari which started inside the area and ended with the Japanese being sent into the cardboard advertising boards. Olympic champion ONO Shohei (JPN) was back to his brilliant best as he won all six contests in Germany to return to the medal podium for the first time since Rio 2016. ONO was matched against silver medallist Rustam ORUJOV (AZE) in a rematch of the Olympic final and the outcome was the same as the Japanese superstar was back with vengeance after a short-lived comeback at the Tokyo Grand Slam in December. ONO, a two-time Düsseldorf Grand Prix winner, could be identified by his gold backpatch which must still be a sore reminder for ORUJOV, and the greatest world number 60 of all time won his second Grand Slam title by throwing his familiar foe ORUJOV with an uchi-mata for ippon. ONO, 26, slipped down to 60th place in the rankings due to his inactivity, but recently completed his studies at Tenri University by submitted his dissertation, ‘An Analysis of Osoto-Gari’. 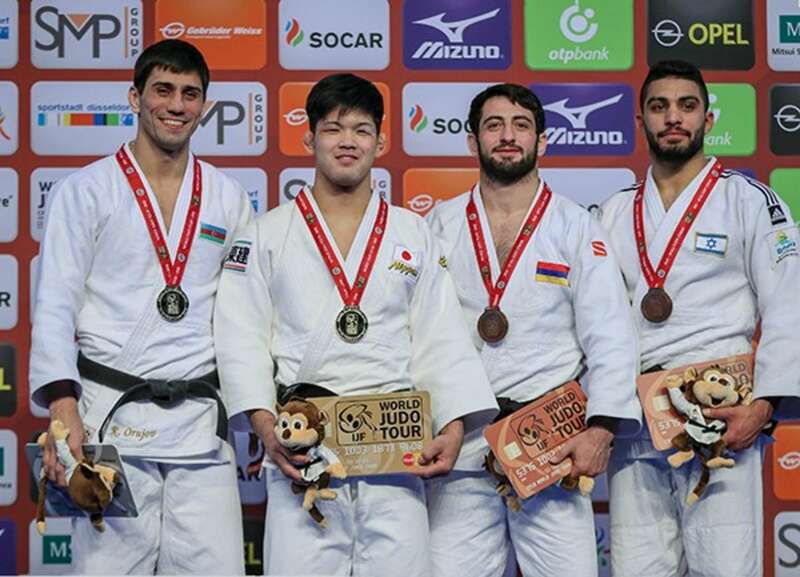 The precocious Japanese judoka extended his winning record in Germany to 17-0 while ORUJOV still looked relatively happy with silver but will have to go back to the drawing board to come up with a new game plan for ONO. In the first semi-final ORUJOV defeated former Havana Grand Prix bronze medallist Igor WANDTKE (GER) in golden score with a ko-soto-gake for a waza-ari score. 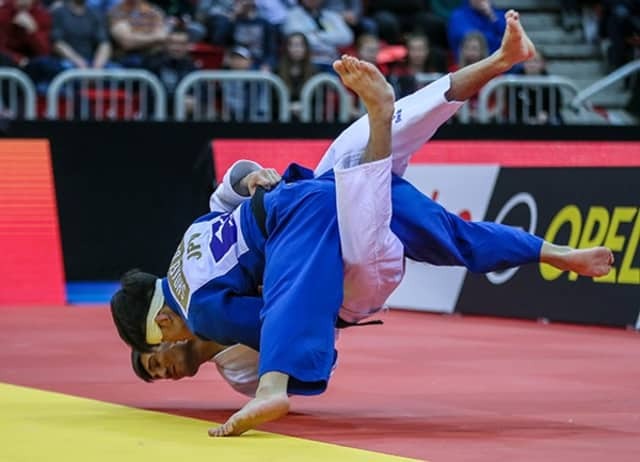 In the second semi-final ONO threw world bronze medallist GANBAATAR Odbayar (MGL) twice to win by wazari-awasette-ippon and guarantee his first IJF medal since winning the Düsseldorf Grand Prix in 2016. The first bronze medal was won by former Samsun Grand Prix bronze medallist Ferdinand KARAPETIAN (ARM) who conquered GANBAATAR after a spectacular tussle. Unseeded KARAPETIAN, who was in a Grand Slam final block for the first time, and his Mongolian rival both had two shidos on their records after one minute of golden score and were on the brink of a third which would have resulted in a disqualification. However, the contest, one of the longest in 2018, was as one of the most exciting clashes of the year so far and the crowd played by their part by energising both men. KARAPETIAN eventually secured a place on the medal podium by ippon after five minutes and 50 seconds of added time. The second bronze medal went to Abu Dhabi Grand Slam bronze medallist Tohar BUTBUL (ISR) who outlasted WANDTKE in golden score. 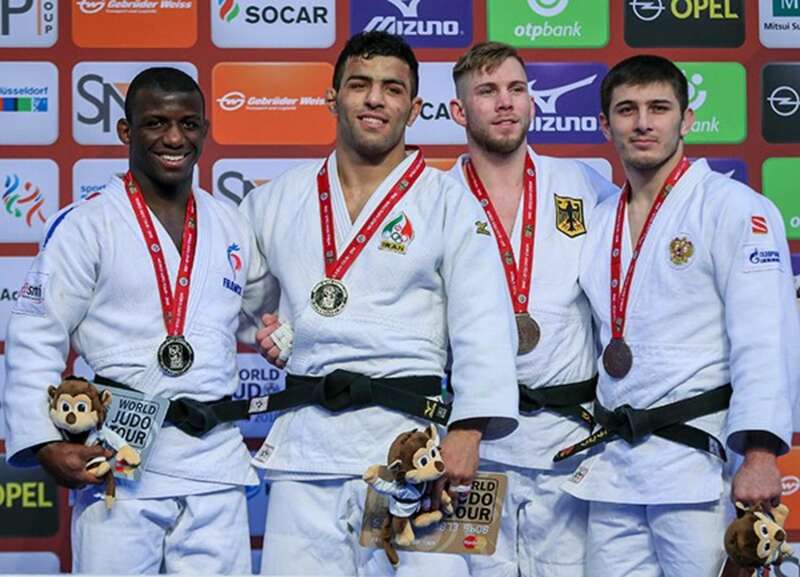 Germany were made to wait for their first medal at their new Grand Slam after world number 11 BUTBUL was awarded the contest after WANDTKE was penalised for a third time which was for attacking with a bear hug and the home judoka was disqualified. World bronze medallist Saeid MOLLAEI (IRI) celebrated claiming a new chapter in his career as he stood on the top spot of an IJF podium for the first time. MOLLAEI has attended 12 Grand Prix and nine Grand Slams and has won his share of medals over the last year during his best spell on the circuit. Unfancied Frenchman Alpha Oumar DJALO (FRA) was a worthy opponent and gave a good account of himself against the world number four in the first meeting between the two. 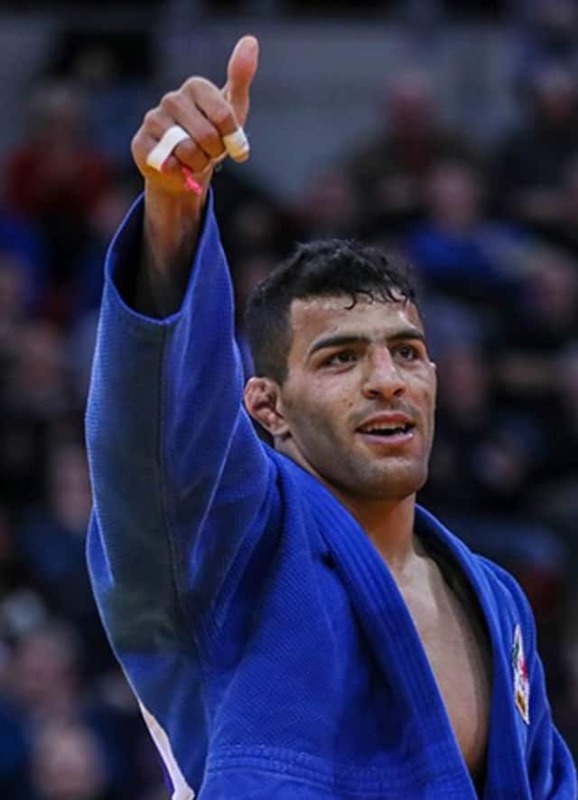 The 21-year French judoka, who looks short but powerful in the -81kg the category, eventually succumbed by ippon as both judoka attained their best Grand Slam results.